Breaking in your pointe shoes is an important step in preparing your shoes to wear for class. There are several benefits to the dancer and the shoe that will assist in better function and comfort. I will first discuss why breaking in shoes is so important, and will then detail our suggested method for breaking in shoes. There are many other techniques and methods that dancers use to help personalize their shoes before wearing them, these however are a good starting point for any dancer. If you find that you need some additional alterations to your shoes, please talk to your pointe teacher! While the term “Breaking In” seems to imply that you are making the shoe softer and weaker, and subsequently shortening the life of the shoe, breaking in shoes correctly can actually prolong the life of your shoe! When a pointe shoe is brand new, the shank (the hard cardboard that runs along the sole of the shoe) is rather stiff and straight. Softening the shank at the place where it will bend naturally with the dancers arch before dancing in them can help the rest of the shank remain stiff for longer. Similarly, softening the place where the shoe will naturally bend at the dancers demi-pointe is also beneficial. Breaking in the shank also aids the shoe in its function as well. 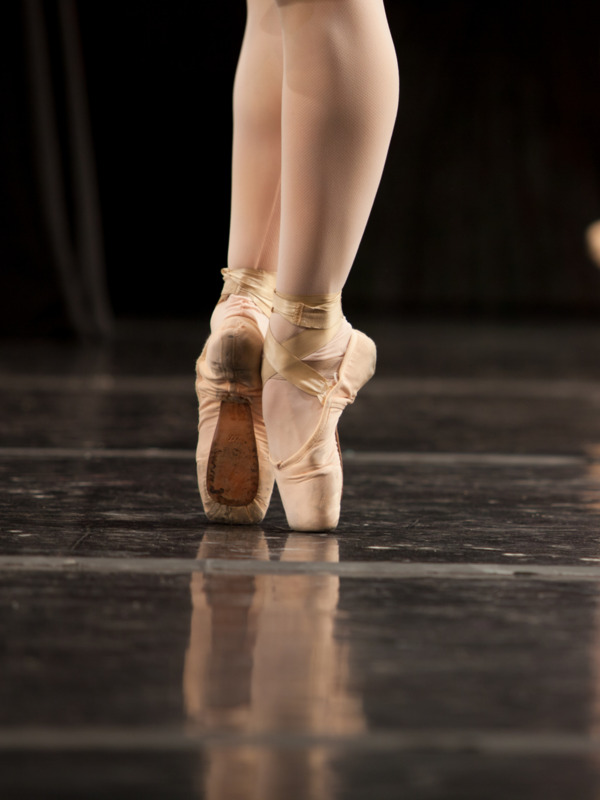 Pointe shoes provide the most support to a dancers foot when the shank closely hugs the arch of the foot. Breaking in the shoe at the arch will help the shoe to perform this function. Breaking in the demi-pointe also will assist the dancer in “rolling” on to pointe more easily through their demi-pointe – an action that is important in strengthening a dancers feet and allowing a smooth transition on and off of pointe. Finally, because new pointe shoes are very hard and stiff, breaking in the shoes before wearing them in class will help the shoes to feel more comfortable. Softening the arch and demi-pointe will also allow them to achieve the movement in pointe class more easily and with less frustration because the dancer will not be fighting against their shoe! Dancers should be careful not to go overboard when breaking in their shoes. Making the shoes too soft will result in improper support of the foot while dancing, resulting in possible injury. In addition the dancer should be sure to wear any tights or padding that she will wear while breaking in her shoes. In order to soften the arch of the shoe, the dancer should place the shoe on her foot without using the ribbon or elastic. The dancer should then fold the back of the shoe backward off of the heel so that the shank is visible. The dancer should then mark where the height of their arch should hit the shank. The dancer can then proceed to gently soften the shank. You DO NOT want to soften the shank so much that it breaks or no longer provides support. You should soften the shank just enough to allow the shoe to bend and follow the arch of the foot. In order to soften the demi-pointe the dancer should also note where their metatarsals bend on the shank. The dancer can either keep the shoe on their foot and use their body weight and hands to bend the shoe, or they can manipulate the shoes with their hands to soften the shoe at this point. The rest of the shank should be left alone as it will be providing support for your foot! This process is a little abstract and difficult to understand in writing so I have also included a video that offers a wonderful explanation and demonstration of this method of breaking in shoes. As always, students should talk to their pointe teachers for advice and assistance in breaking in their shoes for the first time. They are a wonderful resource!